Jordan Brand will be bringing back their winterized version of the Air Jordan 9 for the upcoming Fall/Winter 2018 season. The Air Jordan 9 Boot will be releasing in three upcoming colorways. One is dubbed “Beef and Broccoli” which is most likely this “Brown/Olive” pair (shown below) along with an “Wheat” version (shown below) as well as a “Black” version (not shown). Each pair comes with thick hiker laces, metal eyelets atop an all-terrain rubber outsole to handle the colder months. 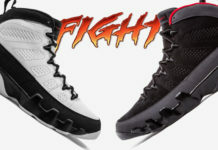 Look for the Air Jordan 9 Boot to release in three colorways on October 13th at select Jordan Brand retailers and Nike.com. The retail price tag is set at $225 USD.